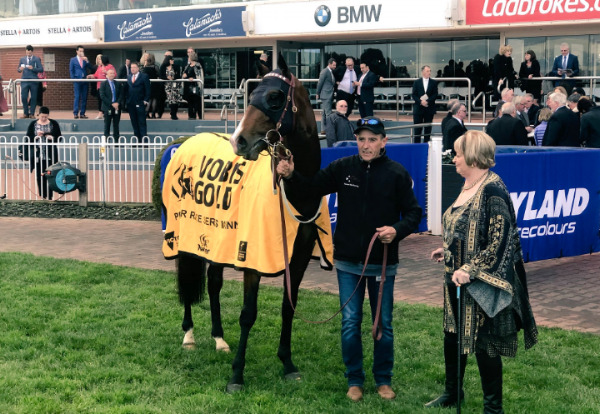 Snitzepeg climaxed another successful season for Federation of Bloodstock Agents Australia (FBAA) with a comprehensive victory at Caulfield’s VOBIS Gold meeting on Saturday. The Darren Weir-trained 3yo reproduced his peak spring form with a two-length victory in the $150,000 VOBIS Gold Reef (1600m). He was bred by Epona Park’s Jeff & Janine Allis after Sheamus Mills Bloodstock bought his dam Pegasus Queen (Fusaichi Pegasus) for $45,000 at a 2014 Inglis Mare Sale. Pegasus Queen is also the dam of Metallic Crown (Northern Meteor) who won the G3 Ming Dynasty Stakes in 2015. It’s the family of NZ colt (Mr) McGinty who beat Marscay in a vintage Todman Slipper at Rosehill in 1982. Mills was one step ahead with Snitzel last month when Special Diva won at Sandown. The Mick Price-trained pocket-dynamo was a $450,000 buy on behalf of SMB clients Rob & June Harding at the 2015 Inglis Easter Sale and she sported Richmond’s AFL colours in the Ladbrokes Multiverse Hcp (1400m). July was also a winning month for John Chalmers Bloodstock with Kakadu (Galah) and Supreme Force (Not a Single Doubt) completing a double at Belmont on July 18. Kakadu has the potential to be aimed for 3yo features at Ascot according to trainer Vern Brockman. Chalmers bought Kakadu’s dam Liberty Isle (Statue of Liberty) for $36,000 at the 2010 Inglis Great Southern Sale on behalf of Rangeview Stud. He also bought Supreme Force at Oaklands when bidding $230,000 for trainers Dan & Ben Pearce at the 2016 Inglis Melbourne Premier. Chalmers kept a share in NZ-bred filly Send My Love after a successful $50,000 bid at the 2016 Karaka National Sale saw her transfer from Brighthill Farm to Alan Mathews at Muchea. The Azamour filly will get another chance at black-type next season after finishing fourth in the LR Belmont Oaks earlier this month. Bluegrass Bloodstock’s Lenny Russo spent an “amazing” time in July visiting Japan’s leading studs and attending the JRHA Select Sales. Within a week of the Hokkaido auction, he cracked a winning double with Magic Millions National Sale graduates Splitter (Ipswich) and Bedrock Dreams (Devonport). Splitter (Foxwedge) is trained by Tony Gollan and cost Russo $41,000 at the Gold Coast in 2016 on behalf of Dream Thoroughbreds manager Dave Azzopardi. Bedrock Dreams (Bon Hoffa) was a $15,000 bargain buy in 2014 and she had won twice at Pakenham for Wez Hunter ahead of a transfer to Rowan Hamer in Tasmania. And in Hong Kong, Aussie-expat Otouto railed up to win on the final day of the season for Pinhook Bloodstock’s Dave Mee. The gutsy gelding suffered a near-fatal injury in the barriers 18 months ago but has come back to reward trainer Tony Millard. Otouto (Haradasun) raced as Libidosun in Australia and was a PBI private purchase from the Chris Waller yard after wins at Wyong and Warwick Farm. His new name means ‘little brother’ in Japanese.